The McClure Law Group is a boutique Dallas family law firm that handles a wide range of matters, including divorce, high net worth divorce, child custody, child support, post-divorce modifications, collaborative law, and appeals. 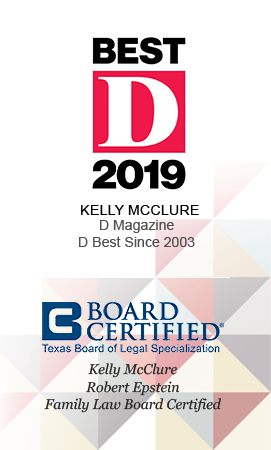 Our founder, Kelly McClure, has been Board Certified in Family Law by the Texas Board of Legal Specialization since 1995 and has been recognized as a "D Magazine Best Family Lawyer" for over a decade. 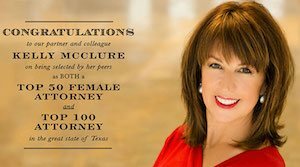 Ms. McClure began her career in tax law, but she now applies her tax law knowledge to high-asset divorces and similar family law matters. Robert Epstein, a partner at the McClure Law Group, is also Board Certified in Family Law by the Texas Board of Legal Specialization as of 2014. Our law firm handles cases in counties across Texas, but we are prepared to travel out of state for matters that require it. If you need a compassionate but tenacious family law attorney to help you build a bright future, the experienced advocates at the McClure Law Group are ready to help you. In order to sue for divorce in Texas, either you or your spouse must have lived in the state continuously for the six months prior to filing. One of you must also have been a resident of the county where you are filing for at least 90 days beforehand. In Texas, there is a waiting period of at least 60 days after the petition is filed before the divorce is finalized, but most divorces take six months to a year to be completed, depending on how many issues are contested. Texas allows no-fault divorces, although in some cases, a spouse's assertion of fault, such as adultery or cruel treatment, can influence property division. A divorce attorney at our Dallas law firm can help you determine the appropriate basis for your divorce and make sure that the required procedures are followed. Generally in Texas, the presumption is that all of the property that you or your spouse earn or acquire while married is community property that you both own and must be divided equally upon divorce. Overcoming this presumption and establishing that property is separate property requires proof that is clear and convincing. High-asset divorces can be complicated because of the nature of the property the couple accumulated during the marriage. A high-asset divorce may also include the division of retirement funds, stock options, pensions, and other assets for which the value is not immediately apparent. Similarly, intellectual property or multiple homes and vacation properties may need to be valued. In addition, couples that own a family business, medical practice, or law practice may have different senses of what these businesses are worth. Our Dallas divorce attorneys work with expert appraisers and financial experts as necessary to establish an equitable division of marital property. Child custody is also known as conservatorship in Texas. Conservatorship includes the right to talk to doctors and other health care providers about the child, the right to access medical, psychological, and educational records, the right to get information from the other parent about the child's health, welfare, and education, the right to discuss your child with school officials, and the right to consent to emergency treatment. When parents can agree to a custody plan, the court usually will simply approve the written settlement agreement. Often, however, parents disagree about child custody. There is a presumption in favor of joint managing conservatorship in Texas, but in some cases, a parent can prove that sole managing conservatorship is in the best interests of the child. Both parents are financially obligated to support a child. The court will typically order child support according to Texas guidelines, which calculate support based on a parent's monthly income with certain deductions subtracted. Generally, a noncustodial parent pays child support to a custodial parent. The child support order may last until the child is 18 or until the child graduates from high school, whichever falls later. Alternatively, if a court emancipates the child or if the child is emancipated through marriage, the child support obligation may terminate. If you are concerned about the amount of child support that you need to receive or that you are being ordered to pay, you should consult the divorce lawyers at our Dallas law firm. Paternity is sometimes in doubt. It may be necessary to establish paternity in order for certain rights and obligations to become clear. Paternity suits in which paternity is determined through a blood test may be brought so that a biological father can secure visitation rights, or a mother can secure child support from a father who is unwilling to pay. In some cases, it is necessary to bring a paternity suit, but paternity can also be established through a signed acknowledgement of paternity form or through presumption. The presumption is that someone is presumed to be the father of a child when the mother and he are married and a child is born during the marriage or within 300 days of a divorce. A presumption can also be established when someone marries the biological mother after the birth of the child and voluntarily claims paternity or represents to others that a child with whom he lives for the child's first two years is his. The Uniform Premarital Agreement Act is in effect in Texas. Under this law, a pre-marital agreement needs to be in writing and signed by the affianced people before they marry. Both people are supposed to disclose their debts and assets before signing, and they must be signing the agreement in contemplation of marriage. Pre-marital agreements and post-marital agreements can change default property rights, so it is crucial for each partner to be fully apprised of the other's financial situation. There are certain conditions that can result in an agreement not being enforceable, such as an unconscionable agreement or involuntariness. After a divorce, the ex-spouses' situations may change significantly. Sometimes a divorce decree or child custody arrangement should be modified. Whoever is asking for a change should retain a Dallas divorce lawyer to seek the modification before the situation becomes such that he or she cannot comply at all. In order to obtain a modification of a child support order, for example, you usually need to prove a material and substantial change in circumstances. Such a change might exist if you were in an accident and became disabled to the point that you could no longer work and therefore could not pay child support. Often, it becomes necessary after a divorce to enforce court orders related to child custody, child support, or alimony. Parents are not allowed to stop paying support because the other parent has not allowed them to visit with the child. Similarly, a custodial parent cannot withhold possession and access rights because the other parent is in arrears on child support. Instead, an enforcement proceeding should be brought with the help of an experienced divorce lawyer in the Dallas area. It may be appropriate, for example, to request an order for contempt of court, which can result in a jail sentence of up to six months and a fine. Divorces often become acrimonious, but they do not need to be. At the McClure Law Group, we are experienced in using alternative dispute resolution methods. Collaborative Law is an alternative method that Kelly McClure has played a significant role in developing in Texas. It emphasizes the creation of a safe environment in which the spouses can express and resolve conflicts without going to court. This approach limits hostile communications, which is particularly important in families with vulnerable children, and it often concludes cases more quickly than litigation does. It also protects privacy in a way that protracted court battles do not. There is a narrow window of time within which you can appeal a divorce decree or other court order. In most cases, you must file an appeal within 30 days of the divorce decree or judgment being entered, so it is important to consult us right away if you may be interested in appealing. The parties have limited grounds on which to appeal a divorce decree. Often, cases are reviewed for an abuse of discretion, which means that the court acted arbitrarily or without reference to the proper laws. If there is substantial proof to support a lower court’s order, however, there is no abuse of discretion. Our law firm is very familiar with the standards used by Texas appellate courts. We can determine whether you have a solid basis to appeal and represent you as appropriate. Our law firm is committed to helping our clients achieve their objectives, and we have the experience and skill to help them navigate through the emotionally taxing and intellectually complex issues that can arise in a divorce. 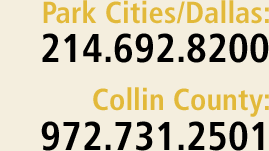 In addition to our main law office in Dallas, Texas, we have an office in Plano, Texas and represent clients in Dallas County, Collin County, Tarrant County, Denton County, Rockwall County, Grayson County, Fort Bend County, Williamson County and Harris County among other localities. Please call us at 214.692.8200 or contact us via our online form to start discussing your situation.